Salmon River Studios is offering three art workshops starting in mid November! Workshops are one day a week for 6 weeks, open to all skill levels and lead by artist educator and Ontario Certified Teacher Gabriel Deerman (MFA). Gabriel is an experienced artist, teacher and has exhibited internationally. 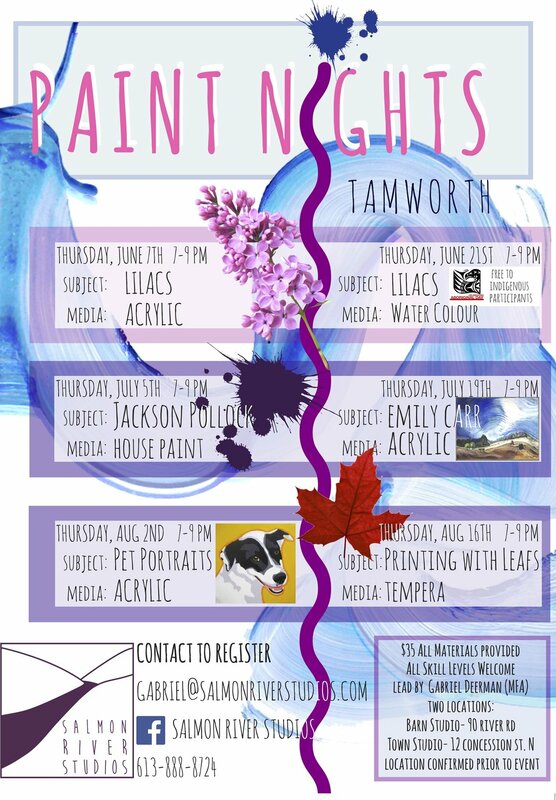 Come kick off the season of paint nights with an evening of pet portraits! You provide the 8"x10" photocopy of your furry friend and Gabriel will provide all materials and instruction. Paint Nights are $35 and all skill levels are welcome! Join Gabriel Deerman for a six session series of life drawing, printmaking & painting! This series is open to all skill levels and participants are welcome to bring their own materials or use materials provided. Gabriel will set up traditional still lifes and guide participants in honing their skills of observation and developing technical abilities. Fee $200 (coffee and tea included;) email or call with questions and to sign up! Plein Air Picnic! Saturday May 27th 10am-4pm Join workshop facilitator Gabriel Deerman MFA of Salmon River Studios in a day of painting, printmaking & picnicking along the beautiful banks of the Salmon River! Friendly and professional pointers on painting techniques and a monotype demonstration after which materials will be provided for those who would like to try this simple, direct and painterly approach to printmaking. At mid day participants will enjoy a delicious picnic meal provided by The River Bakery (included in fee) and are encouraged to bring their own beverages of choice. This workshop will take place at Salmon River Studios (90 River Rd. Tamworth). Salmon River Studios is located a few minutes walk from the town of Tamworth where an ATM, LCBO, grocery store and restaurants are located. For those not wishing to camp, there is a hotel and airbnb options a short distance from the farm. Participants will have access to the barn which has electricity and lighting as well as an outhouse. While dinner is provided (vegetarian friendly/ pls inform us of any food allergies) plan on supplying your own lunches and snacks (no fridge or kitchen access) or walk to Tamworth http://tamworth.ca/ for local culinary delights! And don’t miss the amazing Tamworth Book Shop- full of excellent finds! Soon we will be offering professional development workshops focused on arts integration in the primary and secondary classroom. Workshops will feature introductions to basic skills as well as strategies and tools for student research and inquiry. Included will be USB drives full of materials including complete cross curricular unit and lesson plans aligned to Ontario curriculum! This workshop will feature live models! Yes, naked ones- no giggling please. Participants will be given guidance in exploring the human form and creating effective compositions using traditional media such as charcoal, graphite, conte, and ink. Models will cycle through poses of increasing duration giving participants opportunities for quick warm up studies and more detailed finished works. Paper and a variety of drawing materials provided. This workshop will introduce participants to the simple and direct grid method which allows artists to easily create accurate drawings and paintings from photographs. Surprise yourself (or make a surprise for a loved one!) by creating a realistic and easily recognizable painting of someone close to your heart. No experience is required and all participants will be supplied with canvas, brushes, acrylic paints and any other needed materials. This workshop will introduce participants to ideas and approaches to art making resulting from the increasing acceptance of the term ‘Anthropocene’ as a descriptor of our current geological epoch. The Anthropocene concept has become a major source of discussion and exploration in the arts, humanities and sciences. Current exhibitions at the AGO and National Gallery are bringing increasing attention to the idea- get up to speed in the conversation and explore ways that these ideas and the emotions they inevitably ignite can be brought to landscape painting- a direct and hands on expression of individual interpretations of place and time. How can we build on the tradition of landscape painting in the time of the Anthropocene? Let’s explore this question together through discussion, exploration of texts/artworks and of course- painting! Come to the first ever Family Paint Night with an evening of pet portraits! You provide 8"X10" photocopys of your furry friends and Gabriel will provide all materials and instruction. email gabriel@salmonriverstudios.com to reserve your spot and Gabriel will be in touch with further info and to confirm space availability- space is limited!